October 7, 2010 marked a prime moment in my career. Not only was I awarded a scholarship through the Hispanic Public Relations Association, I was also introduced to some of the most accomplished and respected public relations practitioners in the world. To be around such reputable practitioners was humbling and inspiring all at once. 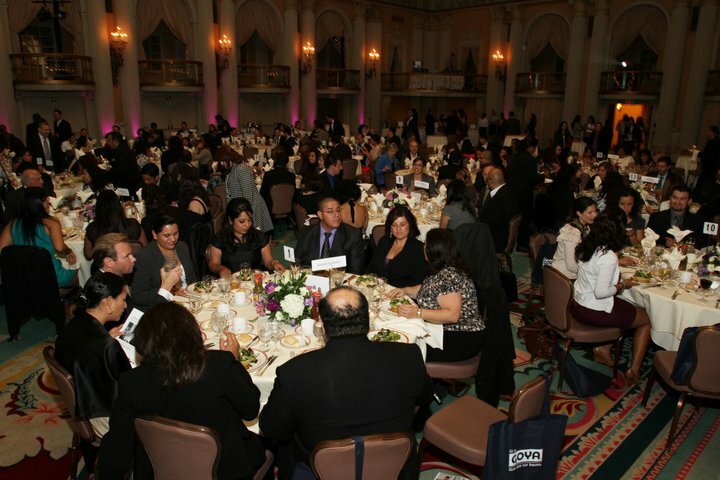 The gala was held at the Crystal Ballroom of the luxurious Millennium Biltmore hotel in Downtown Los Angeles, and was hosted by the lovely Alysha Del Valle, the weekday morning traffic reporter for ABC7 Eyewitness News. Crystal Ballroom at the Millennium Biltmore Hotel – Photography by Eddie SakakiThe purpose of the ceremony was to celebrate industry leaders, scholarship recipients and the best in Hispanic PR campaigns. It was a grand fiesta in which industry peers recognized each other’s outstanding hard work and accomplishments. Alfredo Lee; Account Executive, VPE Public Relations; Young PR Professional Award. Yours truly; proudly representing San Diego State University. Rosanna Fiske, APR. Rosanna Fiske is PRSA’s 2010 chair-elect and HPRA’s 2010 Public Professional of the Year. She has been highly involved in multicultural initiatives and has done tremendous work in helping promote diversity awareness. She was awarded the PRSA 2002 D. Parke Gibson Pioneer Award, which is the nation’s highest individual honor in multicultural communications. Rosanna Fiske has received more accolades than many public relations professionals combined. With Rosanna Fiske (Left) and Marisa Vallbona (Right)Marisa Vallbona, APR, Fellow PRSA. Marisa Vallbona is the President of Cornerstone Integrated Marketing, a highly succesful and long-standing PR firm with offices in Southern California and affiliates throughout the U.S. She is also the San Diego PRSA Chapter Ethics Officer and co-founder of PR Consultants Group Inc. She has been awarded four Silver Anvil awards from PRSA, and has been named “Women Who Mean Business” in PR by the San Diego Business Journal. Clearly a true PR powerhouse. John Echeveste. John Echeveste is the co-founder of VPE Public Relations, one of the nation’s largest Hispanic PR firms. He is also a founding member of the Hispanic Public Relations Association. Echeveste served as the Vice President for TELACU and was also the Manager of Public Communications for the Southern California Association of Governments. With his strong ties and active involvement in the Hispanic community, Echeveste is a truly a pioneer in Hispanic public relations. Manny Ruiz. Manny is the co-publisher of the Hispanic PR Blog and the organizer of the Hispanic PR & Social Media Conference. Ruiz is also a longtime member of the Public Relations Society of America and the immediate past co-chair of PRSA’s national diversity committee. He has also served as a board member of the PRSA Miami Chapter. With his expertise and sunny, dynamic personality, Ruiz is an amazing PR pro and a genuine crowd charmer! Click on the video above to see coverage of HPRA PRemio awards on ABC7 News. Lucía & Richie Matthews. Lucía and Richie Matthews are the founders of Diálogo PR, an award-winning full service PR firm with operations in San Diego and Mexico City. Their agency is comprised by senior-level PR pros who are the perfect resource for clients seeking to generate awareness and activate Hispanic audiences. With resources across the Americas, Lucía and Richie are making a tremendous difference with their one-of-a-kind agency located in San Diego. Oralia Michel. Oralia Michel is one of the most accomplished women in the fields of PR and Marketing. She is an award-winning marketing and public relations professional with more than 20 years of experience leading successful campaigns and programs for ethnic and mainstream audiences across the U.S. and Mexico. She has worked in strategy development, media relations, public affairs, special events, and publishing. Some of her clients include J. Paul Getty Trust / Getty Center, The California Endowment and Toyota Motor Sales USA. Her tremendous contributions to the Hispanic community and communities at large make her one of the most acclaimed and succesful PR professionals around. Lourdes Rodriguez; VPE Public Relations Account Director and HPRA President. Delia Lopez; Public Relations Director at ARAS, Inc. and HPRA Vice President. Denisse Montalvan; Account Executive at Ketchum PR and part of the HPRA-LA board committee. Anaí Ibarra; HPRA Scholarship/College Outreach Director. To view an entire gallery of pictures from the 26th Annual HPRA PRemio Awards and Scholarship Gala, click here. Click here to read the Hispanic PR Blog review on the PRemio Awards. To the PR extraordinaires behind HPRA, ¡mil, mil gracias! I am more determined than ever to give back to my community. Your support will allow me to pursue my goals of reaching out to Hispanic communities across the country. Desde el fondo de mi corazón, gracias nuevamente y, ¡CUENTEN CONMIGO! HPRA was founded in 1984 as a nonprofit organization to establish a network of Hispanics employed in the public relations profesion. HPRA is dedicated to the advancement of Hispanic professionals and provides educational seminars and workshops throughout the year. 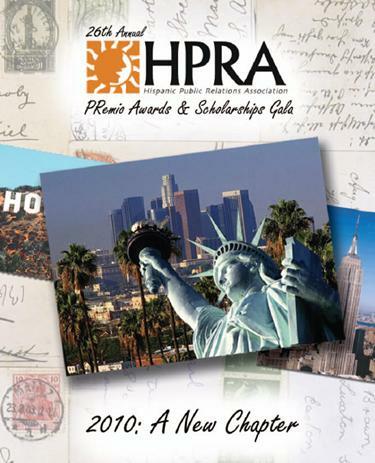 HPRA also grants scholarships to Hispanic students attending Southern California universities and honors notable individuals in communications at its annual PRemio Awards. HPRA strives to be a resource for communications professionals and for those seeking insights into the Hispanic market. To learn more about HPRA, click here. Great review of the event, and wonderful photos! I really like your blog, congratulations again on being selected!